Finally I did it! I finally launched the blog I have been wanting to for a long time. The timing couldn’t get better considering that Indian cinema completes 100 years. 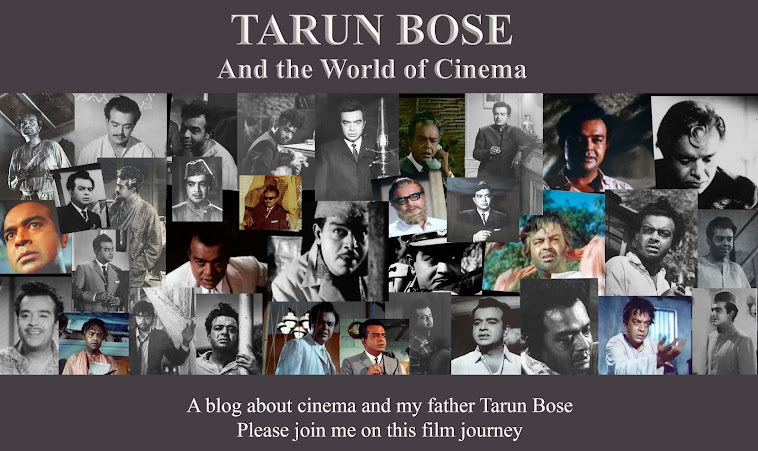 Initially my brother and I had thought of launching dad’s website, but after having had some satisfying discussions on cinema with film bloggers I was tempted to have a film blog which would be both about dad and cinema in general; so now you know why I call this blog Tarun Bose and the World of Cinema. I am overwhelmed by the response to the 'About' page. I have great plans but how successfully I implement these plans remains to be seen. Hamlet was faced with the question “To be or not be?’ and much like him I was faced with the question how and where do I begin? I decided not to repeat what I have already written in my guest posts for Memsaabstory. Those of you who have not read the posts can find the links to the posts on the side bar. My father did a variety of roles – villain, the stubborn father, the soft elder brother, serio-comic roles - he was comfortable doing them all but what he was not comfortable doing was lip-synching to songs and dancing. Once a choreographer decided to teach dad how to do the cha-cha-cha, he would play the record, show dad the moves and ask dad to copy his moves by prompting him with a “One two cha-cha-cha”. Dad just stood there all frozen up, both dad and the choreographer realized it was no use and they soon gave up. Songs however, are an integral part of Indian cinema. Back in the good old days radios held pride of place in every household and films too reflected the same as is evident from this song from Hrishikesh Mukherjee’s Anuradha. The song is sanware sanware unfortunately as pointed out by fellow film blogger Harveypam(in the comments section) the video which I have embedded below has been removed by the user.It was the film's title track and had a close-up of a radio. So for want of the original footage I am giving a link to sanware sanware. This YouTube video has no visuals other than a photograph of Leela Naidu. So I thought to begin with I will post some songs featuring dad. I will, however, not feature the two obvious songs ‘dheere dheere machal’ and ‘gumnaam hai koi’. The songs featured below are not that well-known but I am sure you will agree they are quite beautiful compositions with wonderful lyrics. 'Aur kitne gham' from Jyot Jale was originally shot with dad lip-synching to the song, however after seeing a trial of the film dad was not too happy with the result and he requested Satyen Bose, the film’s director, to re-shoot it with the song playing in the background. I confess I was disappointed because I was thrilled to at last see dad lip-synching to a song, but I have to admit this looks better. Dulal Guha’s Chand Aur Sooraj is another film like Jyot Jale which most people are not aware of. It had some wonderful songs by Salil Chowdhury. I have chosen 'meri aur unki preet purani', not only because you see a rather youthful dad towards the end of the song but also because this is probably one of the earliest lavani – the Marathi folk dance - to be featured in a Hindi film that was not a Hindi-Marathi bilingual film. This lady you see below was an Anglo-Indian junior artiste who used to be seen quite often in films of the sixties and early seventies, I think she later left the country. Here you see him in this song from Bikhre Moti starring Jeetendra-Babita, it took dad a considerable amount of time to get his make-up done for this film, it took him nearly an hour just to get that bearded look. I end with 'naache man mora magan' from Meri Surat Teri Aankhen. I chose this song because in this day and age when it is near impossible to see a classical song and dance number, this song is an audio-visual treat. It is a sheer pleasure to see a trained kathak dancer like Asha Parekh perform so gracefully. This song also reminds me of what my mum used to say; she used to say that dad being a stage actor had a few problems when he first faced the camera, while doing his first film Apradhi Kaun he did not know what to do with his hands, however by the time he went on to Madhumati and Sujata, he had got over that awkwardness. This reminds me of what Ashok Kumar had once said in an interview, he said that as a newcomer he just did not know what to do with his hands, so to counter this problem he started smoking and the 'cancer stick' helped him overcome that problem. Another problem which dad faced initially was pretending to react to a performance when he wasn't actually seeing the performance, all he had to do was react to the camera placed in front of him and not the stage performance which is shot separately. 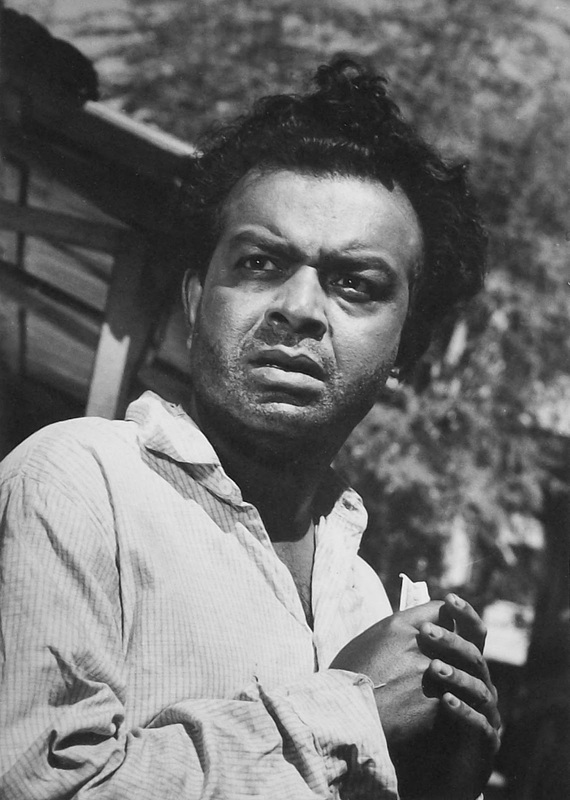 By the time he did Meri Soorat Teri Aankhen he was a few films old and had managed to overcome this problem. Since Bimal Roy launched my father, I thought it would be right to do a post on the legendary filmmaker, so my next post will be about Bimal Roy but I have a request, dear readers, please bear with me, this post calls for some research so it will take some time. Till next time. Thanks so much Shilpiji for this new year gift to all of us. Initially when I came to know of you, I was all star-struck. He has featured in another lesser known song from Bandini (1963). Shashi I had forgotten about this song, thanks for reminding me.Glad you like the blog. This is great Shilpi. I must come back and look at all the lovely songs featured here properly. It is great that you have launched your blog, Shilpi! I will come back in the evening and listen to all the songs, esp Naache man mora ... Keep the trivia coming - I love to read them. Welcome Lalita and thank you very much,hope my brother and I can keep it going. Shilpi, this was very interesting. Like Ava, I'll have to come back later to listen to the songs. What you said about your father and Ashok Kumar not knowing what to do with their hands - it's strange that everyone seems to have the same problem. Amitabh Bachchan said in an interview that when he was new, he didn't know what to do with his hands while facing the camera, so he shoved them into his pockets. Yes Anu most newcomers have this problem, in fact now thar you mentioned what Amitabh Bachchan said, it reminds me that dad had immediately noticed Bachchan's discomfort, after all he had been there already. Lovely blog, some interesting tidbits. I have also read your six-part series about Tarun ji on MemsaabStory. Wishing you and Aroop ji the very best for the blog, will look forward to the next post. Thanks, my next post will take some time so please bear with me we are working on it. Sorry Ash my finger mistakenly hit the publish button before I could complete the reply. You never cease to amaze me you seem to have seen all his films, even I haven't seen them, where do you get them? How lovely to be commenting here, Shilpi. I've listened to the first song, and the last (which I happen to like very much). I remember this film where your father was the father of the singer in the shadows on the stage. Wish you, and your brother all the best. I'm looking forward to your informative posts. I wonder if there was any actor who didn't have this problem? Welcome pacifist, my father played Asha Parekh's father and not Ashok Kumar's - the singer in the shadows. Congrats, Shilpi, on the blog. Look forward to it all! Great to see you here Nivedita. Well, well, this is a surprise, you actually saw that film most people are not even aware of this early Sanjeev Kumar film,it was a flop film and frankly there was nothing exceptional about the film. That was a really novel idea to make a post on hardly known songs with your father in it. Thus could discover many of them. I particularly liked the Insaaf Ka Mandir song. Who is the lady to whom Sanjeev Kumar addresses the song? The anecdotes concerning your father were amusing. As for a lavani song in Hindi film, there is one from the eight years earlier film Aji Bas Shukriya. The song is ghar ki murgi dal barabar with my fav Geeta Bali. BTW the Anuradha video has been deleted. I presume it must have been sanware sanware. naache man mora was an appropriate way to end the post, because that is how I felt after recieving the news that your blog has started the good work to bring together the memories of Tarun Bose. Looking forward to your next post! Can never have enough of Bimal Roy! Harvey the sanware,sanware song was there last night, so I guess it was deleted in the last few hours or after I saw it. Thanks for the link to the Geeta Bali song and also the other link. The lady with Sanjeev Kumar is Snehalata,if you have seen the song 'Humne Dekhi Hai' from Khamoshi you will remember her. I and my brother are hard at work on the Bimal Roy post. In those days characters played by the likes of Tarun Bose, Rehman, Abhi Bhattacharya, Iftikhar are memorable ones. They all had such an amazing personality that they fit in all types of roles. They looked so handsome in playing characters of rich and wealthy. Unfortunately,most of them had a shorter life span. In black and white era they did magic on screen. Would like to have many more write-ups like this. Just like Shilpi Bose, write-ups from the children of those yesteryear artists will go a long way in knowing them more closely. Overall a great effort by Shilpi Bose. She may like to post family photos which will create a great nostalgia for their admirers. So glad to have discovered this blog via Memsaabstory. Thanks Shilpiji for sharing snippets of memories about your father. You are welcome, hope you enjoy it.